Campfires are the perfect transition between summer and fall. We gather around our fire pit during both seasons -- barefoot in the summer, bundled in the fall. The key to a good campfire experience is patience. You never rush the cooking of a hot dog or the roasting of a marshmallow. No, you simply bide your time, rotate your skewer, and trust the flames to do their work. See that sunburst in the background? That's heavenly approval. During these chilled October days, our yard slowly succumbs to the deepening autumn and we put our garden to sleep. Our raspberry bushes no longer offer vibrant bowlfuls of berries like they did during the late summer months, and soon we'll cut them back. Our zucchini plants stop their production with these final offerings: two zucchinis (one the size of a club) that I'll eat with an end-of-the-season appreciation that comes with the sober knowledge that it'll be many long months until I can once again walk outside and pick a portion of my dinner from our garden. 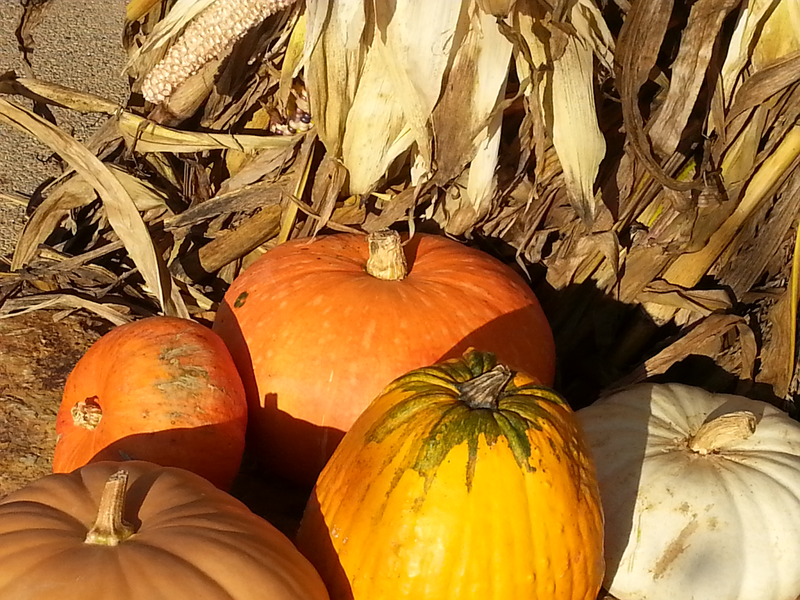 In the meantime, we enjoy a different kind of harvest -- the weekend festivals at local farms where we take hayrides to pumpkin patches and apple orchards. It's so simple, these little moments that make up the seasons, these little moments that make up the fabric of lives that unfold in a small town. Just give me a campfire, and somehow everything seems right in the world. Aw! I just soak this in and love every picture and every part of your garden and transition into fall!! Just lovely Robin! Hi Robin! We just picked our last zucchini too I think. We have a ton of flowers coming out, but I'm pretty sure the impending frost will take care of them! Oooh, I love smores. And your marshmallows do look like a work of art. That's just how I like 'em. My mom? She wanted them burnt! All black, that was her style. You'll find me sitting right next to you at that campfire. I love those too.